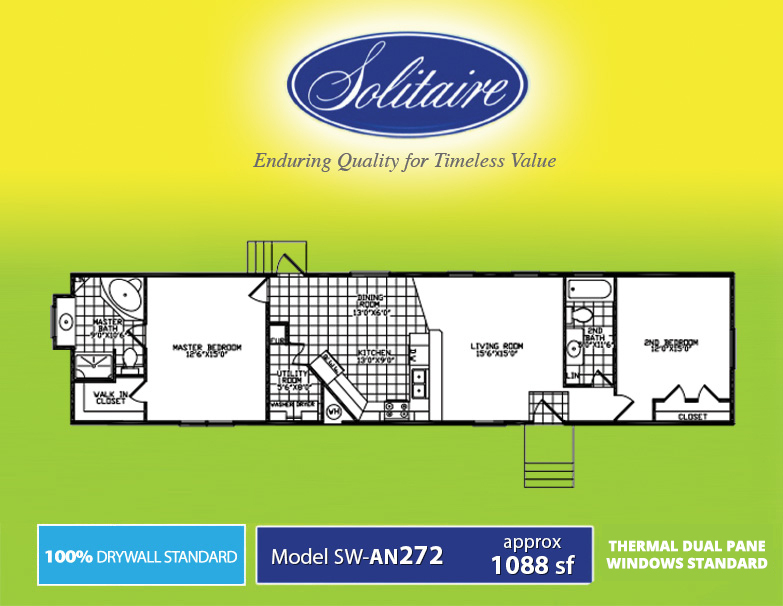 If you’re in the market for a smaller manufactured single section home, consider the attractive, incredibly high quality Solitaire Homes Model 272. In our Solitaire Homes 272 Single Section Home Review we look at just what makes this manufactured home impressive, and three features we think you’ll appreciate. This two bedroom, two bathroom Model 272 may be compact, but it’s loaded with features like two full baths, a spacious kitchen with eat in dining, and a handy utility room. It’s a perfect choice for singles, couples and even new parents. At Solitaire Homes, we take great pride in our construction. From our Energy Star rating to the 40 gallons of Gorilla Glue used on every home plus the screws to the sprayed on vapor barrier, you won’t be disappointed with the quality of our homes. Click to take a Factory Tour and see how we build our homes from the ground up. The layout of Model 272 was designed to make smart use of space while providing spacious rooms, including a large master en-suite and walk-in closet. If you’re interested in learning more about our single section manufactured homes for sale, or our double section homes, contact us or stop by. We’d love to help you find your new home!